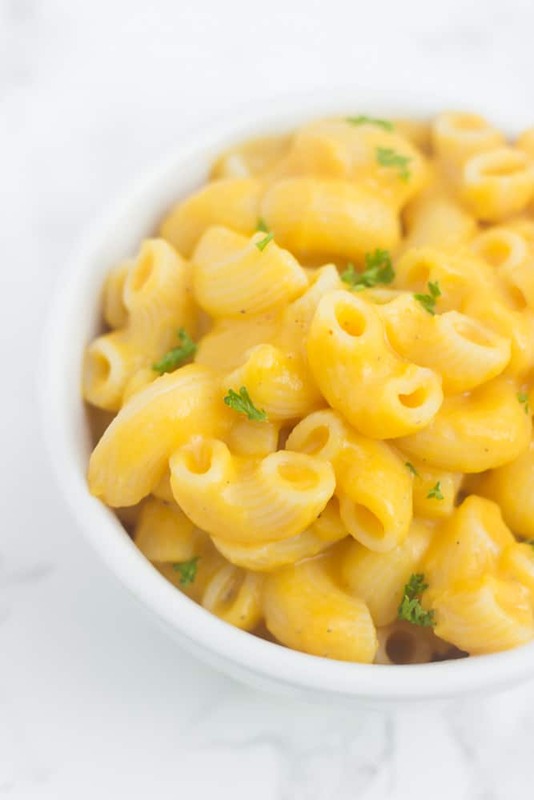 This healthy butternut squash mac ‘n’ cheese is the world’s creamiest mac ‘n’ cheese that’s super easy to make all on your stovetop! I thought the same thing, until I actually tasted butternut squash mac ‘n’ cheese for the first time and it made so much sense. Butternut squash mac ‘n’ cheese is super fun and festive for fall! And now that I’ve made it six or seven times, I could not recommend it more. It is SO CREAMY and super easy. 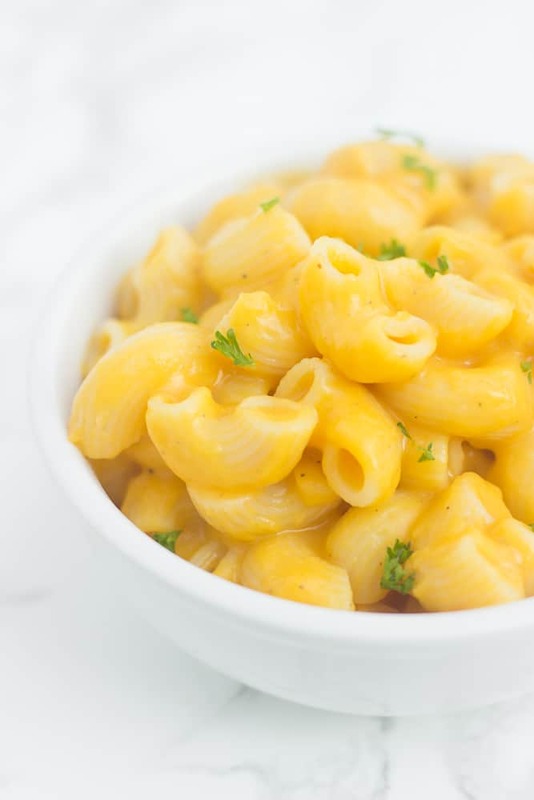 I’m not saying you should add butternut squash to ALL of your mac ‘n’ cheese for the rest of your life (I love this regular version, too! ), but I’m definitely saying you should give this a try. It could change your life. And it’s easy to make! When I first made it, I actually made the sauce all one morning before work. I brought a pot of water to a boil while I showered, boiled the chopped butternut squash cubes while I packed my lunch, and then blended up the sauce while I made breakfast. After work, all I had to do was cook the noodles and reheat the sauce (and add the cheese to the sauce), and then I could dive headfirst into a big bowl of comforting noodles. You do need to use a blender (or an immersion blender) for the sauce, but can use the same pot to cook both the squash and the pasta, which helps cut down on dishes. To make this even more quickly, you can buy packages of pre-chopped butternut squash, which cuts down 10 or 15 minutes of prep work. You can also buy cans of butternut squash puree (similar to canned pumpkin! ), which I imagine would work, but haven’t yet tried. I like to peel and cook my own squash since it’s the freshest, and it’s pretty easy to do if you have a sharp knife! Just cut off the top and bottom of the squash, then use a vegetable peeler to take off the skin. Cut the squash in half lengthwise, scoop out the seeds, and then slice into long vertical strips. Then dice those strips up into small squash cubes. 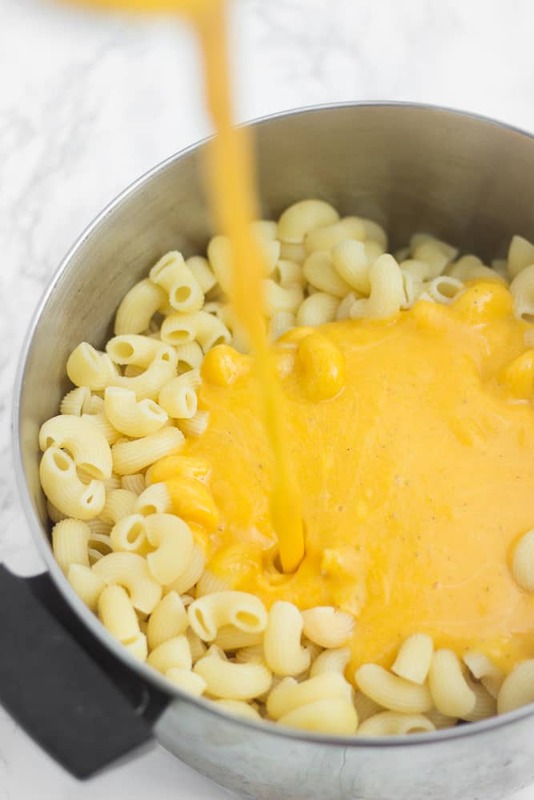 Promise me that if you love mac ‘n’ cheese, you’ll give this a try! If you try out this healthy butternut squash mac ‘n’ cheese, feel free to let me know in a comment or take a picture and tag me @livbane on Instagram. Hope you enjoy! Cook squash: Fill a medium pot 3/4 of the way with water and bring to a boil. Meanwhile, peel the butternut squash with a vegetable peeler and scrape the seeds out with a spoon. Chop squash into one-inch pieces and transfer into pot. Boil the squash until tender, about 12-14 minutes. Drain squash into a colander. Cook pasta: Refill the pot with water and bring back to a boil to cook the pasta. Drain pasta once it's just short of al dente. Make sauce: While the pasta is cooking, transfer the cooked squash to a blender and add milk, paprika, salt, and pepper. Blend until a smooth sauce forms. Add sauce back to the now-empty pasta pot and heat on medium heat until warm. Add cheese and stir until melted. Add noodles, stir, and serve immediately. If sauce becomes too thick, add another splash of milk. Store leftovers in airtight container in refrigerator for up to 3 days. I’ve seen so many people use butternut squash for mac n’ cheese, and I got some last week to try a recipe. It just looks SO good, and I love unique recipes like this. That’s cool that God made such a brilliant orange vegetable that imitates the color of normal mac n’ cheese so well. Even though I like the cheesy kind just as much, I’m excited about trying this variety of mac n’ cheese. I’m looking forward to cooking for you at Thanksgiving! I am looking forward to having this at Thanksgiving. Yum, I know how good this must be. 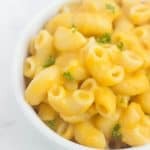 I loveee mac and cheese, and this is a great way to sneak in extra veggies for sure! I’m impressed with your knife skills, I have so much trouble cutting butternut squashes! I watched a great video tutorial one time about how to cut a butternut squash and it was so helpful. I’ve done it that way ever since! Butternut squash is one of my faaaaavourite ingredients and using it in pasta sauces is one of my favourite ways to use it. This looks perfect! I agree!! It makes pasta sauce SO creamy and delish!! My daughter loves Butternut Squash. 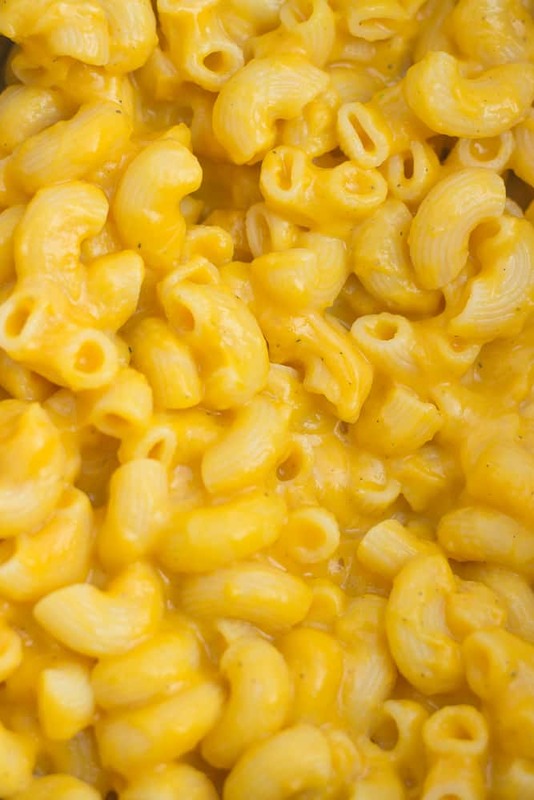 And a combination with Mac n Cheese… A big yes from her.